Performers in “Floor of the Forest.” Winarsh-Documenta, 2007. Diane Madden, one of the newly appointed associate artistic directors of Trisha Brown Dance Company (TBDC), has been walking around the Getty Center all day. She arrived from New York City the night before, and she’s scoping out the landscape where Trisha Brown’s Roof Piece will be performed this Saturday afternoon. Roof Piece originated in 1971 atop buildings in a 10-block area of New York’s SoHo. Twelve dancers transmitted movement from dancer to dancer, roof to roof. This will be ne of only a few re-mountings of the piece and the first time it will be seen in LA. 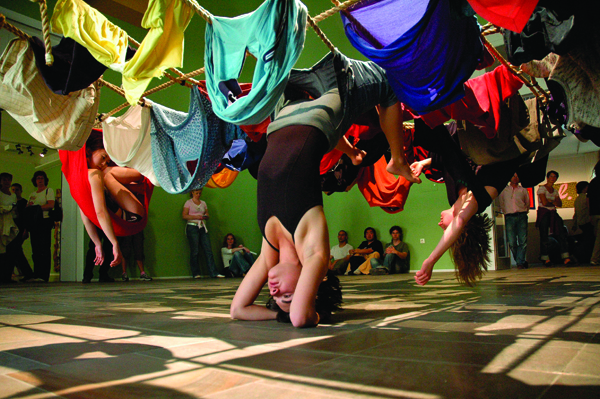 Roof Piece is just one of the works presented this week as part of CAP (Center for the Art of Performance) UCLA’s Trisha Brown Dance Company: The Retrospective Project, which includes eight proscenium choreographies and several site-specific works from one of the most widely acclaimed choreographers in postmodern dance. During Brown’s five-decade-spanning career, she was the first woman choreographer to receive the MacArthur Foundation Fellowship, in 1991. She was awarded the National Medal of Arts in 2002 and the Dorothy and Lillian Gish Prize in 2011. Kristy Edmunds, artistic and executive director of CAP UCLA, planted the seed for the retrospective at the end of 2011.